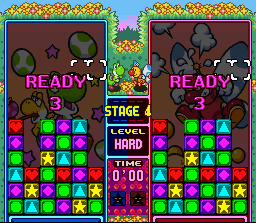 While not as blatant a rip-off that Super Mario Bros. 2 was to Doki Doki Panic, Tetris Attack still retained a lot of Panel De Pon's original content. Though the passwords were changed, the cheat codes and huge Puzzle mode stayed the same! 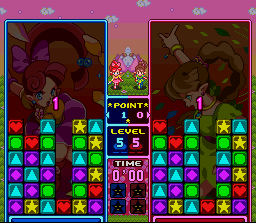 Tetris Attack also had quite a bit of original artwork made for the backgrounds and such. 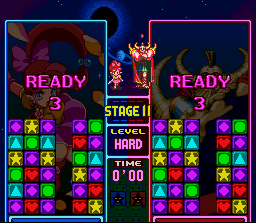 As you can see from the extra choice in Tetris Attack's mode select screen, Panel De Pon never had an Option mode. 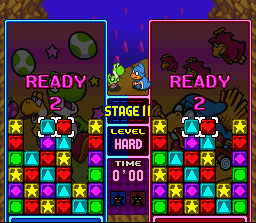 Another improvement in Tetris Attack was the addition of a password system for the 1-player Vs. mode. 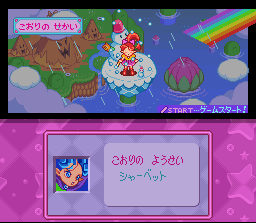 (In PDP, selecting Vs. mode from the menu takes you right to the game, giving no opportunity for entering passwords.) Notice the lack of password on the left side of the PDP screen shot below. 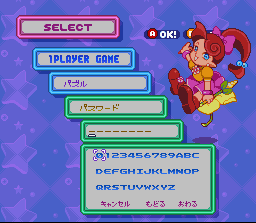 In the Stage Clear and Puzzle modes, passwords aren't interchangable between PDP and TA, unfortunately. 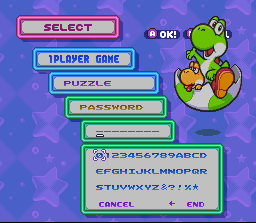 One reason might be because Tetris Attack has a few more characters available for its password system. Lip's Fairy Land becomes Yoshi's Island. 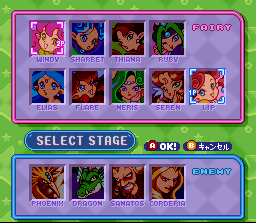 These screen shots from the 2-player Vs. mode show all the characters. 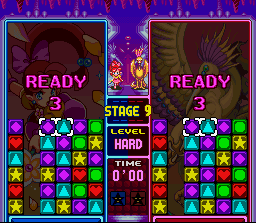 The "name tags" didn't make it into Tetris Attack. 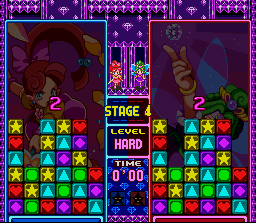 In PDP, there are 13 different Garbage Block designs; one for each character, matching the theme of their stage. 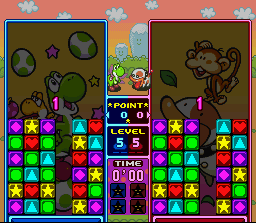 The designs were narrowed down to two in Tetris Attack, with your character throwing out the blue ones, and your enemies attacking with red ones. 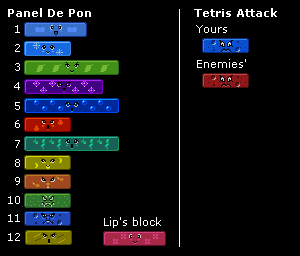 The Garbage Block design in Tetris Attack is a modified version of Sanatos' blocks (#11). 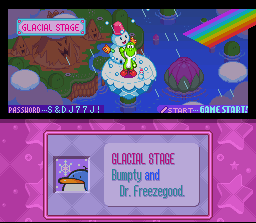 While most of the stages in Panel De Pon had easy matches for Super Mario World 2 characters, no character really fits in with the jewel motif of Ruby's stage (stage four in Vs. mode). 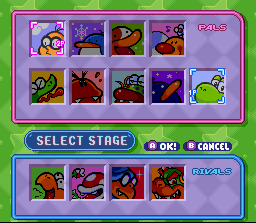 Any character had a chance to sneak into the game here, and Wiggler gets the nod for stage four in Tetris Attack. 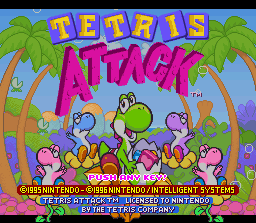 For the three opponents leading up to Bowser, Tetris Attack used the background from the cinema scenes when you're in the Cave of Wickedness. 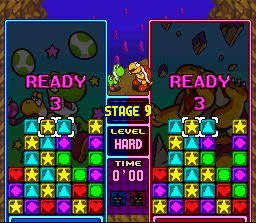 Bowser's stage is a modified version of Dragon's stage (stage 10 in Vs. mode). 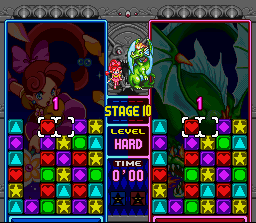 This leaves PDP's stages 9, 11, and 12's backgrounds unused in Tetris Attack. 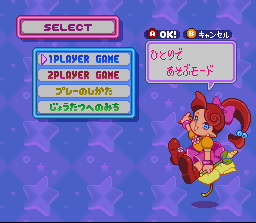 Panel De Pon's Japanese voice samples had to be changed for Tetris Attack's characters, obviously. And that's about it for sound effect changes. 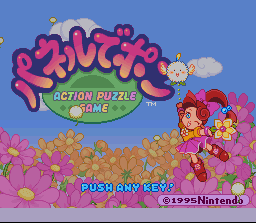 The title screen uses SMW2's title music. 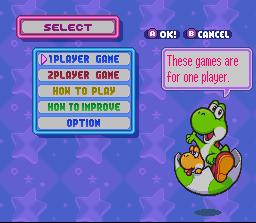 Yoshi's theme and the Game Over screen uses SMW2's "story" theme. 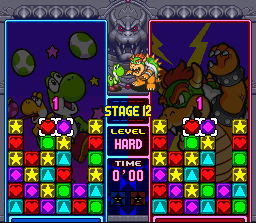 Bowser's theme (stage 12) was originally Sanatos' theme (stage 11 of PDP). 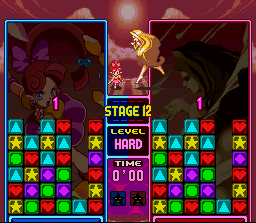 Corderia's theme (stage 12 of PDP) was not used in Tetris Attack. 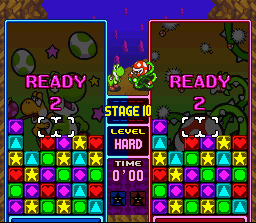 Kamek's theme (stage 11) uses the same music as stage 9 and 10.